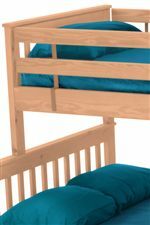 This mission-style bunk bed is an excellent space-saver in any youth bedroom or cabin. Both beds feature an appealing mission-style design on the headboard and footboard and boast a hand-crafted look great for any decor. Most importantly, this set was designed with safety in mind. 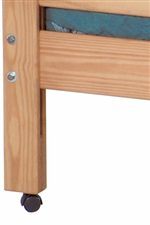 It features safe spaces between the mission-style posts, removable guardrails on both sides of the upper bunk, a secure-hooking ladder, and added height between the beds to ensure individuals can sit up comfortably in the bottom bunk. 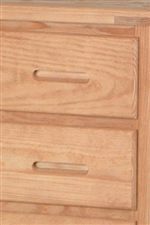 With multiple size combinations available it is easy to find a bunk that fits everyone's needs. 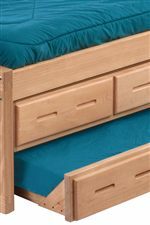 Bunk beds available in twin/twin, twin/double, twin/queen, double/double, and double/queen. The Pine Bedroom Mission-Style Twin Over Double Bunk Bed by Crate Designs at Jordan's Home Furnishings in the New Minas, Halifax, and Canning, Nova Scotia area. Product availability may vary. Contact us for the most current availability on this product.